1. Quality. All select superior raw material, with mature producing technology and high standard quality control and inspection system, we can greatly guarantee the quality. 2. Price. Factory direct sells, offering you the most competitive price! 3. Service. Quick response on quotation, sample and after-service. 4. Scale. Top 3 manfuacturer of aluminum collapsible tubes in whole China, with annual capacity of 300 million pcs. 5. Experience. Nearly 40 years' accumulated specialized producing experience in this field. 6. Production Lines. Full automatic production lines from Germany and Italy. Custom design available, OEM/ODM welcomed ! The normal round tube, oval tube and super flat tube are available here, diameter ranges from 13.5mm, 16mm, 19mm, 22mm, 25mm, 30mm, 35mm, 40mm, with the capacity 5ml to 200ml accordingly. There are 1-6 colors offset printings here, The cap is also made with various choices, such as screw cap, flip cap, etc. 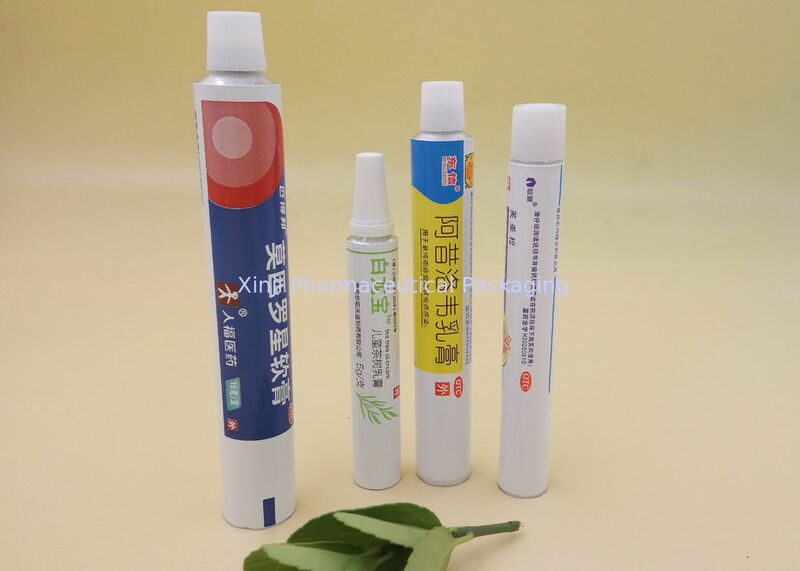 Our tubes mainly used for medicine, adhesive, tooth paste, eye ointment, hand cream, facial milk and some food packaging, etc.